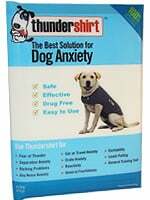 Thundershirt Behavior Modification Shirt For Dogs - XLarge - Blue is the proven solution for dog anxiety. Thundershirt Behavior Modification Shirt For Dogs - XLarge - Blue is the proven solution for dog anxiety. Thundershirt uses gentle, constant pressure to calm your dog, effectively aiding anxiety, fearfulness, barking and more. Thundershirts create gentle pressure that has a dramatic calming effect.